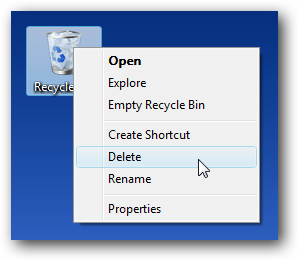 One of the changes in Windows Vista was the easy way to remove the Recycle Bin from the desktop (simply right-click and delete)… unfortunately this sparked a new problem where unwitting users started deleting the Recycle Bin instead of Emptying it and were unable to figure out how to restore it. This has become such a big problem that I’ve received dozens of emails asking how to prevent deletion of the recycle bin. In fact, one reader was so angry with me because he couldn’t stop himself from repeatedly deleting the Recycle Bin that he ended up calling me a bunch of names (which I found somewhat humorous). What we’ll do is disable this menu item using a small registry hack. The item will still show up, it just won’t work anymore. Unfortunately the user can still click on the icon and use the Delete button on the keyboard, but we can’t do anything about that. You’ll want to first create a new key called “Shell” on the left hand side, then a key named “Delete” under that, and then another key named “command”. 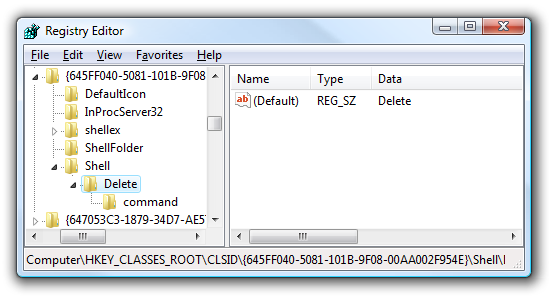 Set the default value of the Delete key to “Delete”, and then set the default value of command to “rundll32.exe”. What we’re doing here is creating a new function called Delete that replaces the current command on the menu. 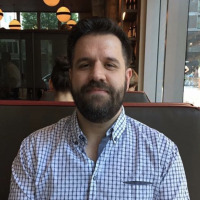 By setting it to run rundll32.exe, we’re eliminating any error message by running a valid process (that will immediately exit and the user will never see it). 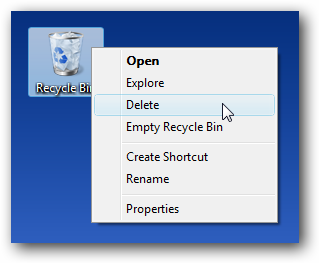 The only visible change you’ll notice is that the Delete menu item will move above the Empty Recycle Bin item. Simply download, extract, and double-click on DisableRecycleBinDelete.reg to enter the information into the registry. There’s also an included EnableRecycleBinDelete.reg file that will set it back to normal.